One of the things I mightily struggle with is trying to instill virtue in my kids. 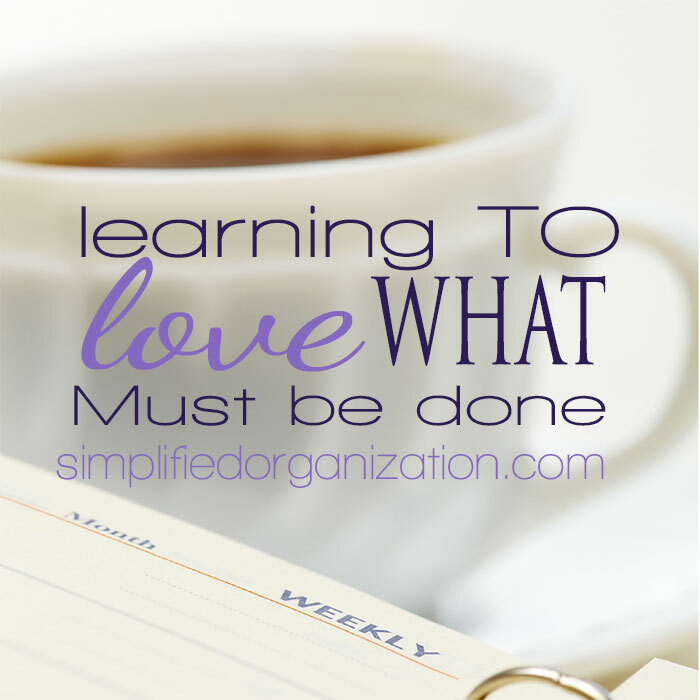 I have tried several different ways and methods of doing so and none of them have felt right or stuck with our family for very long. 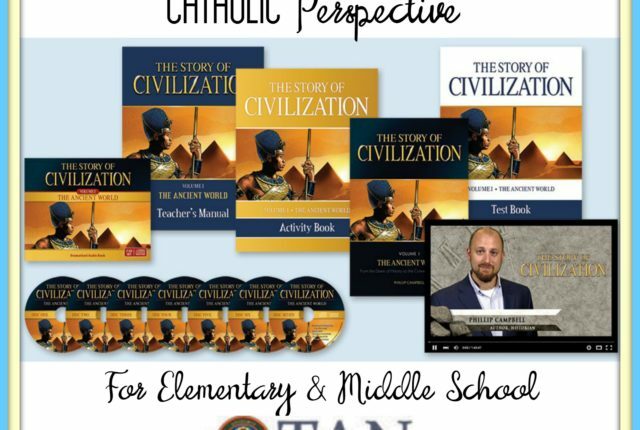 I received a message from Monica Speach about her Catholic character program, Program for Achieving Character Education for Catholic Schools and Homes (or PACE). 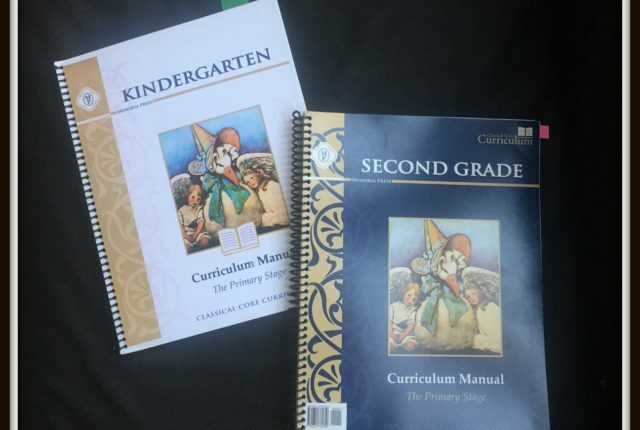 A few days later, she had sent over both the manual as well as the K & 3rd Grade workbooks. 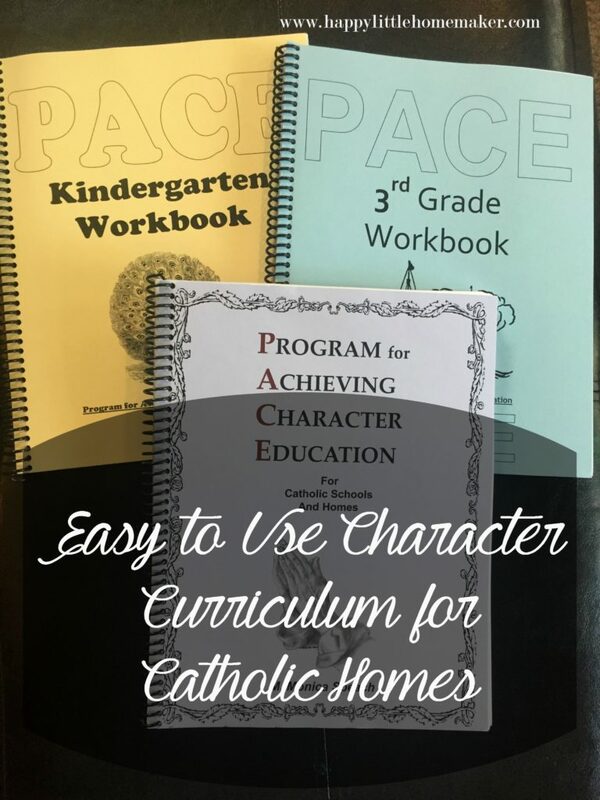 PACE is a character education program for Catholics. It could be used for other Christian denominations, but it does have a pretty prevalent emphasis on the Saints. You could skip it, but they are good Godly examples, no different that “regular” missionaries and such. There are three books heavily used throughout — William J Bennett’s The Book of Virtues and The Moral Compass as well as The Book of Saints. 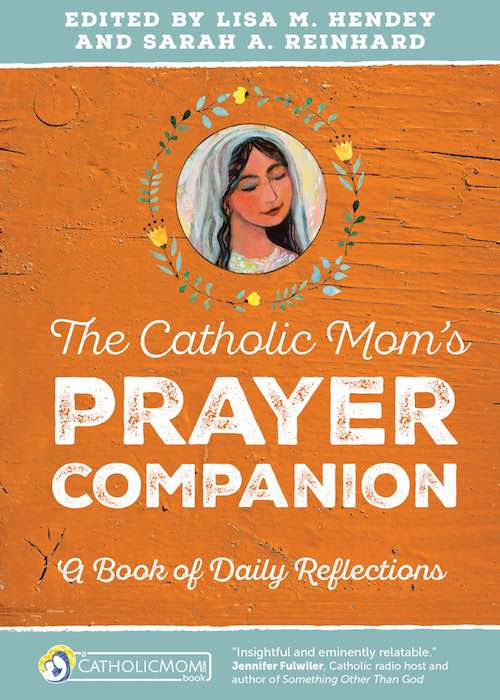 The last is not required like the other two, as she includes web links, but I prefer to hand my child an actual book. I happened to have all 3 books on my shelf already, so I didn’t need to buy any of them to use her curriculum. But you should :). While the manual can be used on it’s own, there is no schedule to help you use it on its own. I had a similar protestant version of something like this and just couldn’t get it done without it being laid out for me. Luckily, that is what the workbooks do! Each month is divided into 5 days of activities. 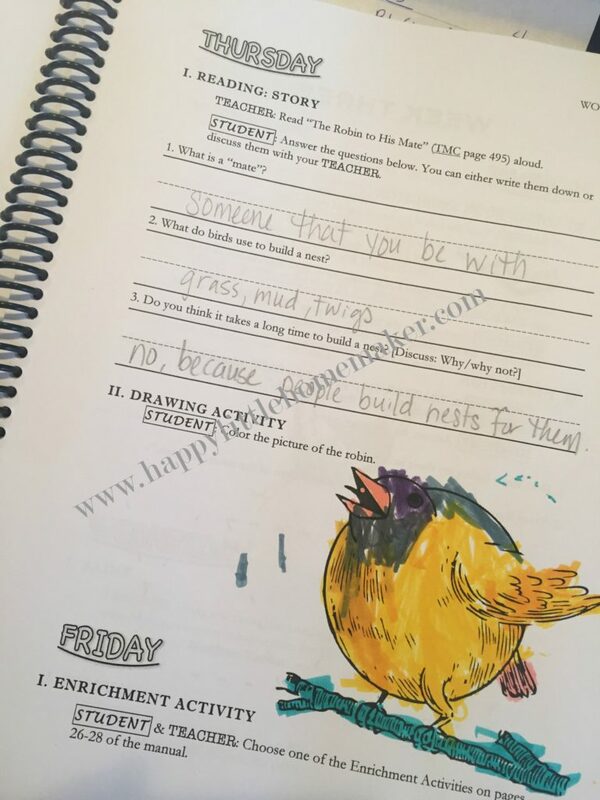 One month of 3rd grade (from the workbook) looked approximately like this. 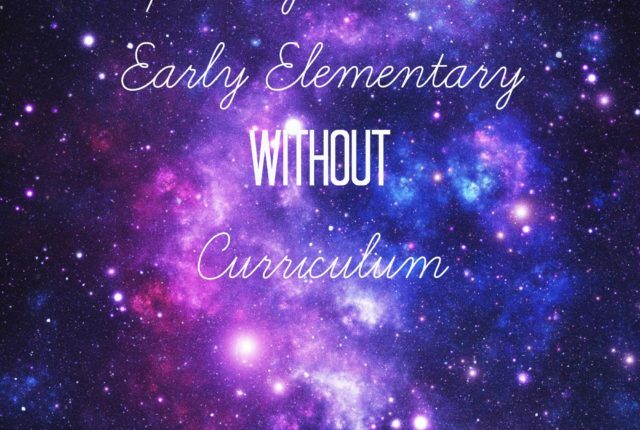 The PACE Manual is $26.95 and the workbooks are available for Kindergarten through Sixth Grade and are $12.95 each. The Kindergarten schedule is very similar to third grade except there are activities like coloring something, a maze, etc. The workbooks are laid out by week and day of the week. It is designed for 5 days a week and takes a very short amount of time to complete. The K work can be completed in 5 minutes or less, the 3rd work in about 10-15 minutes, depending on how comfortable your child is with certain activities. Anything requiring writing takes my 3rd grader longer ;). And the Friday enrichment activities can take as long as you let them. Or not. I have to admit that I am either extremely lazy or super efficient. Take your pick. I do not like to prepare, gather supplies, or anything of the sort. I have enough moving pieces to deal with in my life and planning out a non-primary subject is just more than I am willing to deal with. I jumped right in the day after it came in and then looked at it a little more closely during our break week. Since we do school 4 days a week, I had to eliminate a day or double up on a day. I chose to eliminate the extra book for both girls on those days. Not only did I not feel like making extra library trips, but we read A LOT and have read most of the extra book suggestions already. If we had a suggested book, we would read it, but I wasn’t going to go out of my way for it. My third grader already has a ton of reading and I wasn’t going to add another chunk a day that she had to read. I also cut out the enrichment activities most weeks because those fell on Friday’s and we have a light day on Friday’s due to afternoon Ice Skating and errands that need to be run that day. Life :). We did the rest, though. 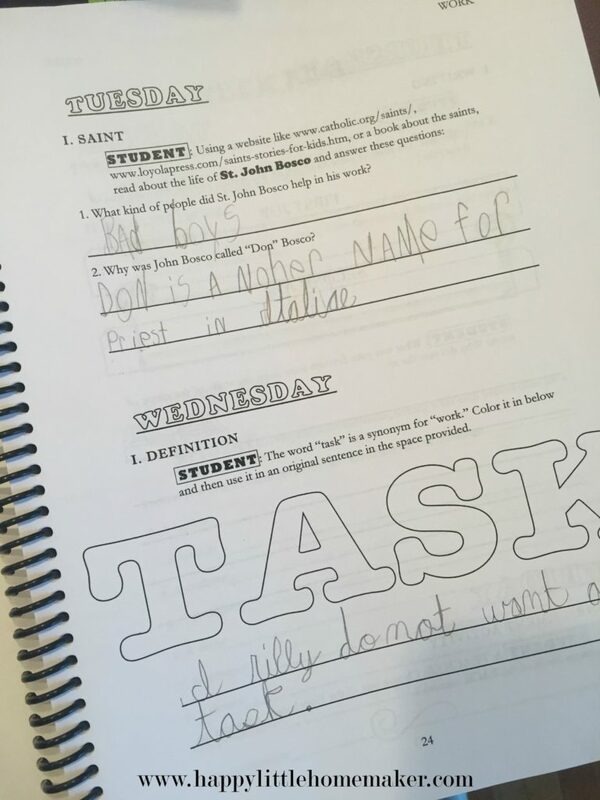 My K likes the workbook and my 3rd grader did not complain about adding *yet another* subject. I enjoyed having discussions with my K and liked the stories and questions from BOV/TMC and the saints. It was a super simple way to introduce a subject and talk a little bit about it every day with out it being preachy and “you need to…” which is one of the problems I ran into with other programs. I need that scripted for me; it doesn’t come naturally. Over all, I like how PACE is laid out in the workbooks. The manual has good information, but I need it handed to me. 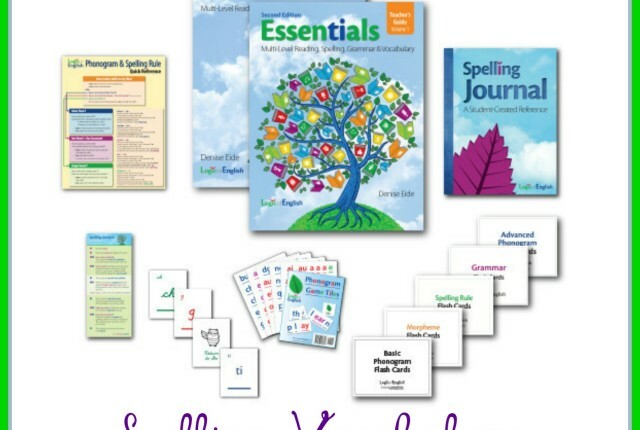 For me, the workbooks are ESSENTIAL (or a lesson plan grid at the very least). If you are better at building your own thing and just need ideas, you might just want the manual. We used it for a full 6 week term (so far) and I still haven’t managed to find the perfect place in our schedule for it. I hesitate to add it to bible/prayer time and morning time is packed. I’m hoping that I can give it more focused time and attention during the lighter Christmas Term, but I wanted to share it now so that you could peek at it to start during the holidays (like I am) or do something new when you go back to school in January. New year, new start and all that jazz. I do think that it’s laid out well-enough and valuable enough to persevere in REALLY giving it the time that it’s worth (even if that is mostly in my own mind and attitude, because really, it doesn’t take that long) and finding a good home for it in our day. The kids enjoy the story, workbooks and discussions. And I think that doing more of the enrichment & additional reading that we have cut could be valuable time spent, too. 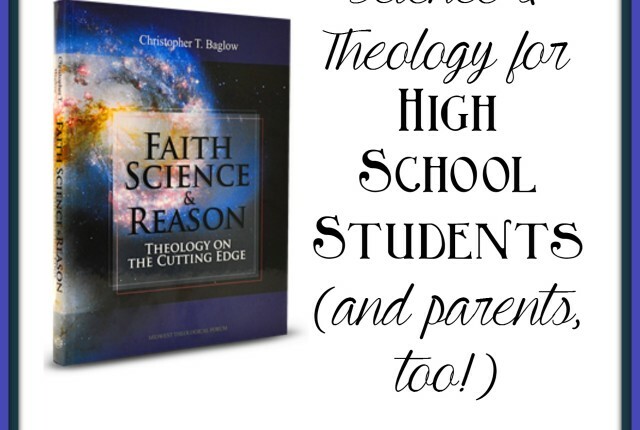 If you have a homeschool mind but your kids are in public school, PACE could be a great afterschool/weekend activity for any Catholic home. It would reinforce your values, introduce some good stories and read-aloud & discussions and help shore up skills your child is doing in school. 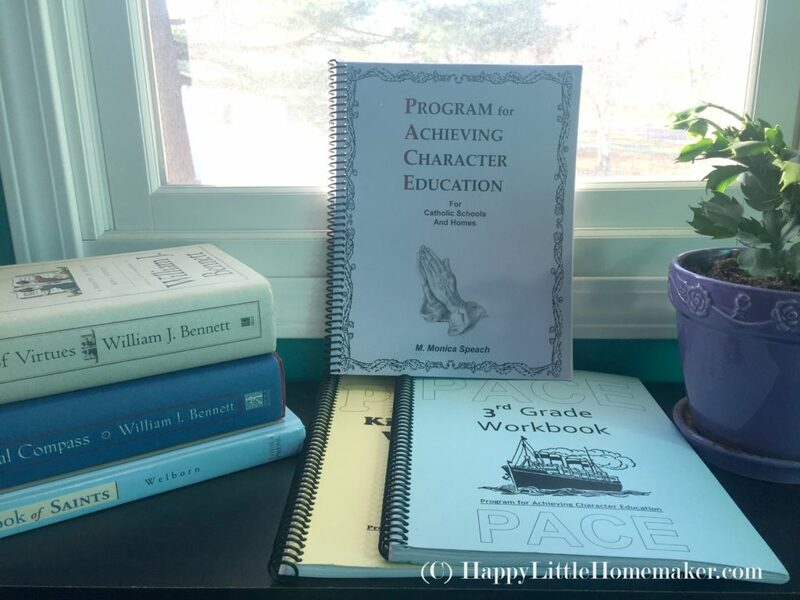 Do you use a special virtue or character formation curriculum in your homeschool?